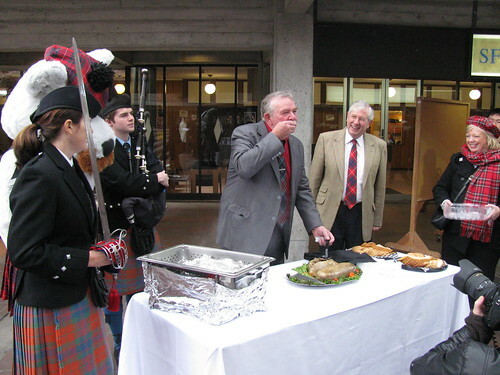 No Burns Day celebrations at Simon Fraser University… a sad day indeed! No Robbie Burns Day to celebrate Scottish culture at SFU. There are no Robbie Burns ceremonies at Simon Fraser University this year. No SFU Gung Haggis Fat Choy Festival either. Both the Ceremonies Department and SFU Recreation and Athletics cite budgetary restrictions. Are the universities so tight for cash that there are no pennies left in SFU's sporran? How much is it for a haggis and a bagpiper? (note: I phoned the office of SFU President Andrew Petter, and was informed that the budget cuts happened before Petter took office in the Summer – so the plot thickens… SFU has known that the Burns ceremonies was canceled since at least September… and still nobody did anything?). In recent years, SFU has celebrated Burns Dinner, by having the three city mayors of Vancouver, Burnaby and Surrey, who also happened to have Scottish ancestry, attend Burns ceremonies at the three cities where SFU campuses are located. The Burns ceremonies have grown more elaborate over the years. When I helped out in 1993, the ceremony was simple. The bagpiper led, I followed holding the sword upright, and the haggis carrier followed, and we delivered the haggis to the main cafeteria, where somebody must have given the Address To a Haggis. Hmmm…. I think that SFU not celebrating Robbie Burns Day, would be like NOT having a Chinese New Year parade in Vancouver Chinatown, or no St. Patrick's Day Parade in Vancouver for March 17th! But wait… The occurrence of the 2010 Winter Olympics opening on the same weekend as Chinese New Year almost necessitated the cancellation of the Chinese New Year Parade last year, but was saved as the parade was opened earlier in time to clear the streets before an afternoon hockey game. Sadly, the entire week of Celtic Fest activities was canceled in March due to venues being booked for Olympics and Paralympic events. But Simon Fraser University doesn't have to compete with the Winter Olympics, they are only citing budgetary constrictions. How expensive can a single haggis be? I first became involved with the strange customs of Scottish-Canadians when I was asked in 1993 to help with the Burns Day ceremony. I was a student tour guide, and we were paid to give tours to visitors. But nobody wanted to carry a haggis, and wear a kilt. Being loyal to my job, I hedged… “I'll do it if you can't find anybody else,” I said to our team leader, being very mindful of all the deep snow around campus that cold week in January. They called back, and the rest is the stuff of legends. “Toddish McWong” made his media debut in both the Vancouver Sun and Vancouver Province, for being multicultural open to embracing a Scottish tradition, which in 1993, was 2 days away from Chinese New Year. “Gung Haggis Fat Choy” was coined as a word, and would follow me for the next few years, even after I graduated from SFU, and never even tasted the haggis that day on the mountain. Years later I would invite friends to the first Gung Haggis Fat Choy Robbie Burns Chinese New Year Dinner. We had 16 people in the living room of a private townhouse in North Vancouver. Our host Gloria hired a bagpiper, from the SFU Pipe Band. I cooked most of the Chinese dishes. We served the haggis with sweet & sour sauce, and with plum sauce. “Toddish McWong” at the Scottish Parliament exhibition of “This Is Who We Are: Scots in Canada. Parliament, where I encountered a life-size picture of myself. In 2004, I received a phone call from SFU Recreation Department, asking if I could help them create an event that could bring together the University's Scottish heritage and traditions with the large Asian population of students. In January 2005, we unveiled the SFU Gung Haggis Fat Choy “Canadian Games”. 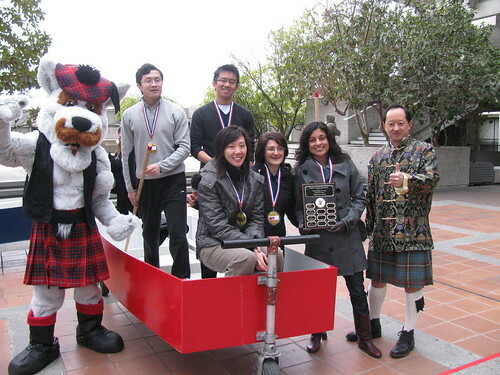 Sadly there are no dragon cart races for SFU Gung Haggis Fat Choy Festival this year. But last year, McFogg the Dog and Toddish McWong posed with the winning team in 2010 – The Wellness Warriors. We created dragon cart races – imagine dragon boats “paddling” across SFU's convocation mall. Imagine trying to have the world's largest “Haggis eat-in.” It was a big hit. Okay, not the haggis bit… but many students tried haggis and said they liked it. For the past few years, I have been the race commentator for the dragon cart races. It is always fun to watch people having multicultural fun, and playing with the cultural stereotypes. But sadly…. not for this year at Simon Fraser University. This entry was posted in Asian Canadian Cultural Events, Main Page, Multicultural events, Origins of Gung Haggis Fat Choy, Scottish, Gaelic, Irish Celtic events and stories, SFU Gung Haggis Fat Choy "Canadian Games" on January 21, 2011 by Todd. come to Victoria and Nanaimo! I have long wanted to do a Gung Haggis Fat Choy Dinner in Victoria and Nanaimo. These are both significant cities in BC history for Scottish and Chinese pioneers. I want to create small intimate dinners that were like the first restaurant Gung Haggis Fat Choy Dinner of 40 people, which followed the initial dinner of 16 people in a living room. At the very first dinner, I invited friends – many of whom had Chinese or Scottish ancestry. Each guest was asked to bring a song or a poem from Chinese or Scottish culture, or help present a Robbie Burns Supper tradition. I cooked most of the Chinese dishes that were served. I made a lemon grass winter melon soup, stir-fried snow peas with scallops, steamed salmon with garlic and hot oil, sticky rice. Fiona brought the haggis. Rod picked up the lettuce wrap from Chinese take out. Gina made a noodle dish. And in between each dinner course, we read a poem or sang a song. I read Recipe for Tea, from the Chinese-Canadian anthology “Swallowing Clouds,” written by my friend Jim Wong-Chu, which described how tea first came to the UK from China via Scottish traders.” Gloria read the Burns poem “To A Mouse”. Her friend gave a Toast to the Laddies. Gloria even hired a bagpiper! It was a wonderful evening… the first Burns Supper I ever attended. And I only learned about the elements of a Burns Supper, by going to the Vancouver Library where I worked, and asking for details at the reference desk. Rev. 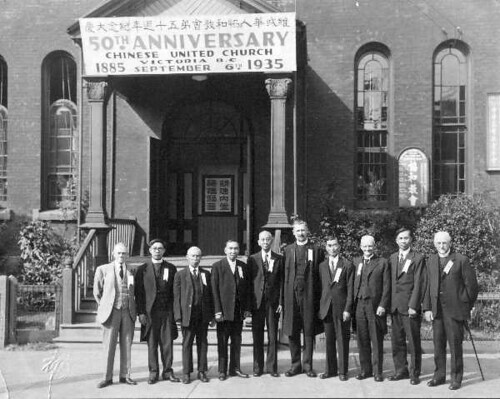 Chan Yu Tan is 4th from the left, standing beside his elder brother Rev. Chan Sing Kai, at the 50th Anniversary of the Chinese United Church in Victoria. Victoria was the first port of entry for all the Chinese immigrants coming across the Pacific Ocean by boat. It once was one of the largest Chinatowns in North America, and the oldest in Canada. My great-great-grandfather Rev. Chan Yu Tan arrived in Victoria in 1896, following his elder brother Rev. Chan Sing Kai, who came in 1891 to help found the Chinese Methodist Church, which later became the Chinese United Church. This has now been told in the CBC documentary Generations: The Chan Legacy. Meanwhile, on my paternal grandfather, Wong Wah, also came to Victoria, as a sixteen year old in 1882. He worked in a Chinese dry goods store for his uncle, and later managed the store as it became one of Victoria's largest Chinese merchant stores. Scottish influence is found throughout Victoria. It is as easy as the street names of Caledonia, Balmoral and Craigflower. The first governor of British Columbia James Douglas was schooled in Scotland, due to his Scottish father's influence, even though his mother was a creole free black. It was Robert Dunsmuir, born in Hurlford Scotland near the town of Kilmarnock, that became one of the richest men in North America by being a coal baron. Dunsmuir served as premier of BC, as did his son. Craigdarroch Castle in Victoria, was built by Dunsmuir as a gift to his wife, but he died a year before it was completed. Rev. Chan Yu Tan also ministered at the Chinese United Church in Nanaimo. From there, he would often travel to the mining town of Cumberland to also minister to the Chinese labourers there. It was coal baron Robert Dunsmuir that owned the coal mines around Cumberland and Nanaimo. During a general strike at the mines, Dunsmuir used Chinese labourers as strike breakers. Although it is now little more than a ghost town of a few remaining buildings, Cumberland was once one of Canada's largest Chinatowns – so big that it could sustain two Chinese opera houses. Author Paul Yee's new play Jade in Coal was set in Cumberland. The Nanaimo dinner will be a joint-venture with my friend Shelagh Rogers, CBC broadcaster, who now hosts The Next Chapter on CBC radio. Shelagh has been organizing Reconciliation dinners between Aboriginal and Non-Aboriginal people. Awhile back, she asked me about creating something similar to a Gung Haggis Fat Choy Dinner, which she co-hosted with me in 2005. I said, “How about a Gung Haggis Fat Choy Pow Wow Dinner” that could embrace all three pioneer cultures? And that is exactly what we will have on January 23rd. We are inviting friends with Chinese, Scottish and First Nations ancestry and culture and having a dinner. We shall see what people bring to the table in songs and poetry that will reflect our desire for cultural harmony and fusion, as well as reverence for our shared but distinctive past. 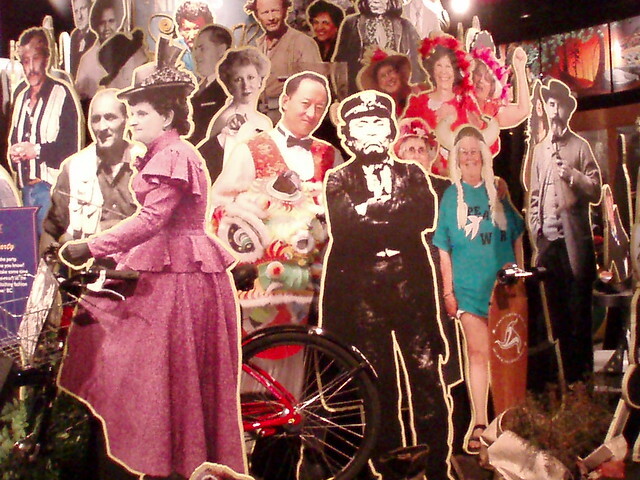 A picture of Toddish McWong included in 150 of BC's historical and contemporary figures invited to “The Party” installation to help celebrated 150 years of BC History at the Royal BC Museum in 2008. This entry was posted in 2011 Gung Haggis Fat Choy Dinner, Chinatown Vancouver, Gung Haggis Fat Choy dinner, Main Page, Origins of Gung Haggis Fat Choy, Rev. Chan Legacy Project, Upcoming Events, Vancouver Area Adventures on January 18, 2011 by Todd. printmaking co-operative; I've been a member since 1997). The exhibition opens June 7, 6-9 pm and continues until June 24. This entry was posted in Origins of Gung Haggis Fat Choy, Upcoming Events, Vancouver Area Adventures, Visual Art and related events on June 7, 2007 by Todd. Vancouver's Two Solitudes… 2001 Census results: Scottish? Chinese? How many? 2001 Census: Scottish? Chinese? How many? earliest pioneering cultures, along with First Nations of course. I regard the Scots and Chinese as British Columbia's “Two Solitudes,” which Wikipedia describes as “A phrase expressing Canada's bilingual and bicultural nature. Scottish names in my extended family tree now. According to the 2001 Census results for Vancouver. people who most count English, Chinese, Scottish as the ancestry. also would most likely represent the newest immigrant groups. widely known that she was born in Hong Kong. to be open-minded about race, religion, and culture…. aren't we? This entry was posted in Main Page, Multicultural events, Origins of Gung Haggis Fat Choy, Vancouver Heritage and History on October 13, 2006 by Todd. Happy Hogmanay – listening to BBC Radio Scotland Live! It's almost midnight in Scotland. I am listening live to BBC Radio Scotland, as they count down the minutes. Now they are going live to Edinburgh…. A pipe major plays the bagpipes. There is a countdown…. 10, 9, 8, 7, 6, 5, 4, 3, 2, 1…. Then everybody sings a song – what is it?? It's not Auld Lang Syne!?!?! It's some song about Happy New Year! They pop a champagne cork. Now I hear accordion music… sounds like a polka – no it's not. Now they thank Radio Scotland listeners from around the world. a “Eat Haggis” bridge, and words about Toddish McWong. This entry was posted in Origins of Gung Haggis Fat Choy, Scottish, Gaelic, Irish Celtic events and stories on January 1, 2006 by Todd. Does “haggis wun-tun” translate into french? houses in the Library Square area. Nigel was very intrigued by the concept of Chinese-Canadian and Scottish-Canadian cultures mixed together. suis nay a Vancouver. Je suis cinquieme-generation Canadien! This entry was posted in GHFC 2004 Media Stories, Main Page, Origins of Gung Haggis Fat Choy on July 22, 2005 by Todd. What is Gung Haggis Fat Choy? 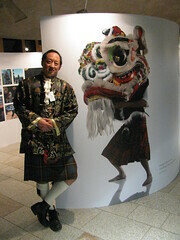 It is the inter-section of Chinese and Scottish cultures. Just like some perverse mix of multi-culturalism. It is the play on words. It is the play of time and place. And you don't get what you don't see. This entry was posted in Main Page, Origins of Gung Haggis Fat Choy on January 28, 2005 by Todd. Who is Toddish McWong? And how did you come up with Gung Haggis Fat Choy? declined but the tour guide leader later begged Wong to reconsider. “You're my last hope,” she said. Wong relented. Scottish kilt and having to show his bare knees out in the snow. growing appreciation of Scottish Canadian history and culture. Scottish songs for himself to play on his accordion. recreated – he no longer wanted to cook 8 courses for 16 people. first wore as a kilt), and the dinner size reached 390 people. bassist Harry Aoki did duets with vocalist Margaret Gallagher. accompanied duet with Toddish McWong on accordion himself. For 2004, the dinner grows every upward and onward. Actor/director Adrienne Wong will co-host with Toddish McWong. Vincent and Cameron Collins perform on both nights. + mini features on Robbie Burns, Chinese New Year and haggis. when The National started its Road Stories in Vancouver. McWong and Tom Chin. Haggis Lettuce Wrap made it's debut. and Joy McPhail switched cheongsam and tartan. This entry was posted in Main Page, Origins of Gung Haggis Fat Choy on January 17, 2004 by Todd.